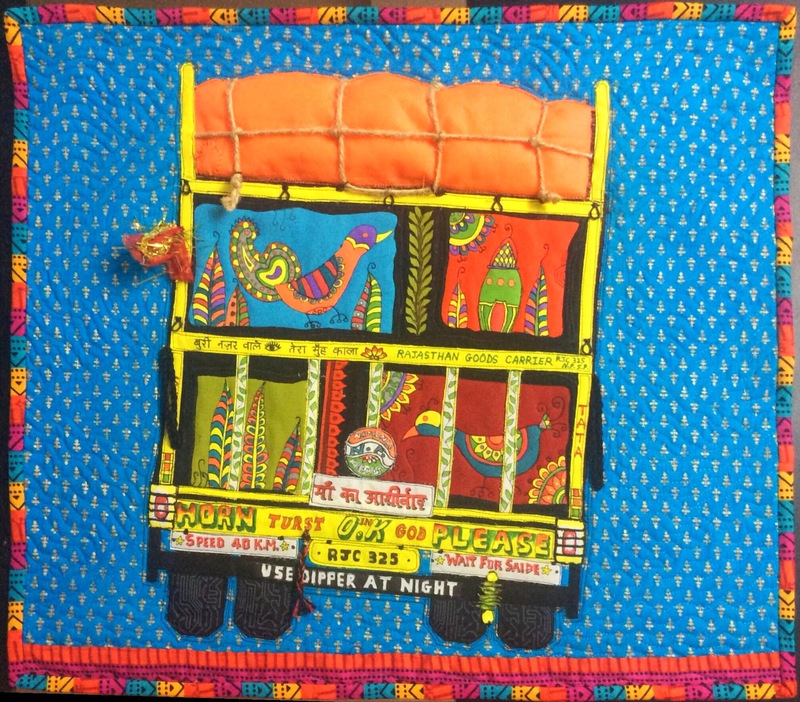 Ever since I started quilting, I have wanted to make quilts depicting essentially Indian themes, and the colours seen on my country’s roads and highways were right up there on my list! 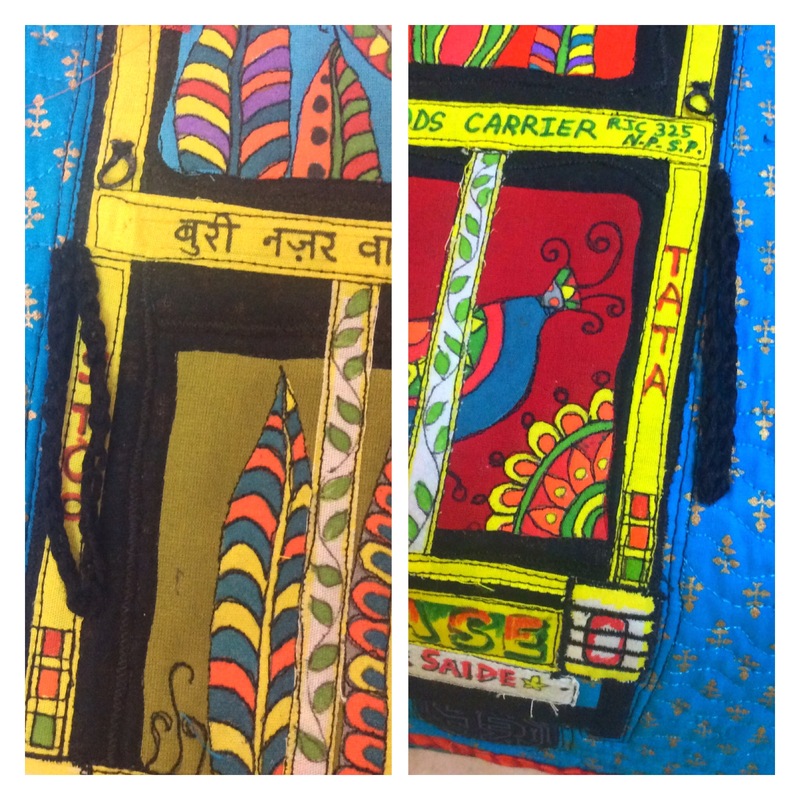 Remember, a couple of months ago I had shared the story of the purple autorickshaw designed and paper pieced by me? I had also designed a truck and a cycle rickshaw around the same time, which I never did get around to making. 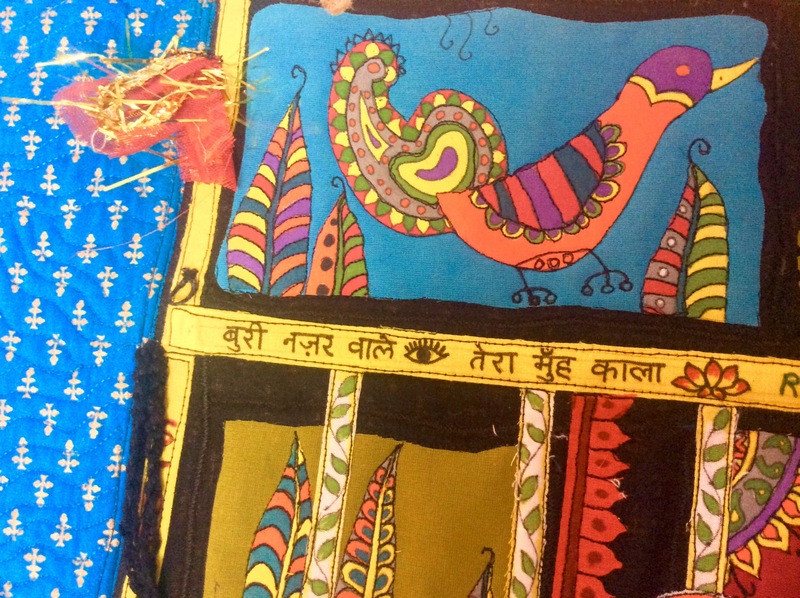 Then, last month I attended a attended a workshop by Pam Holland on painting your own fabric and a chance remark set me off on a new quilting adventure. 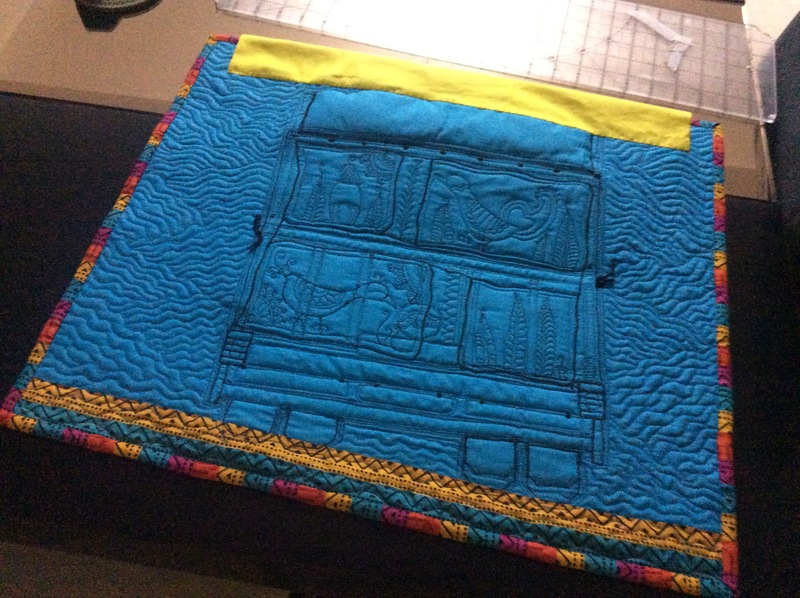 I had not been able to finish this quilt in the workshop and was still wondering how I could personalize it when my little seven year old niece looked at it and remarked, “Is that a road runner?” I knew it didn’t and that she was only trying to show off that she knew there was a bird called the road runner, but this got me thinking of a different kind of road runner! 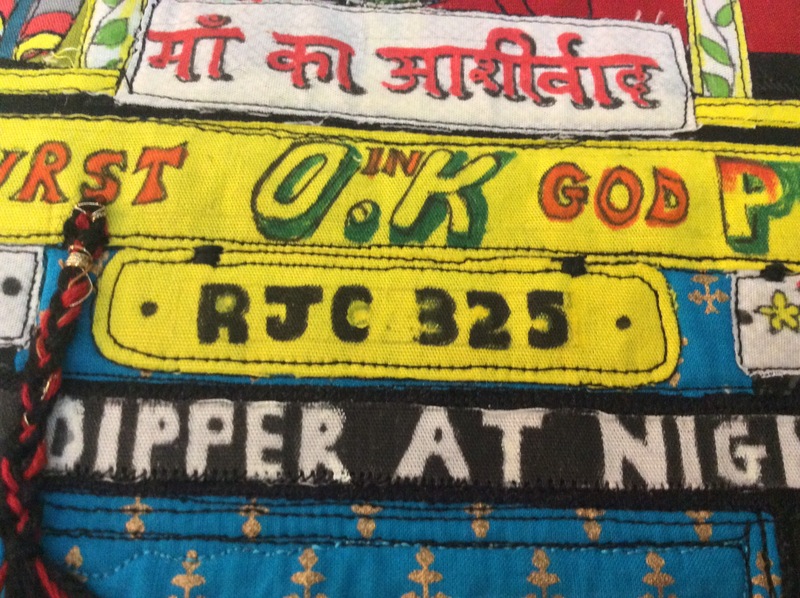 The Indian truck driver is a much maligned person. He travels for long, unregulated hours, often away from home for days on end. His dearest companion then is his vehicle, which he often refers to as his beloved and pampers and decorates to his heart’s content! His artistic bend of mind will be obvious to anyone who sees the often elaborate paintings on the truck. You only have to read the couplets painted on his truck to recognize that not only is he is a poet at heart, but a budding philosopher too! 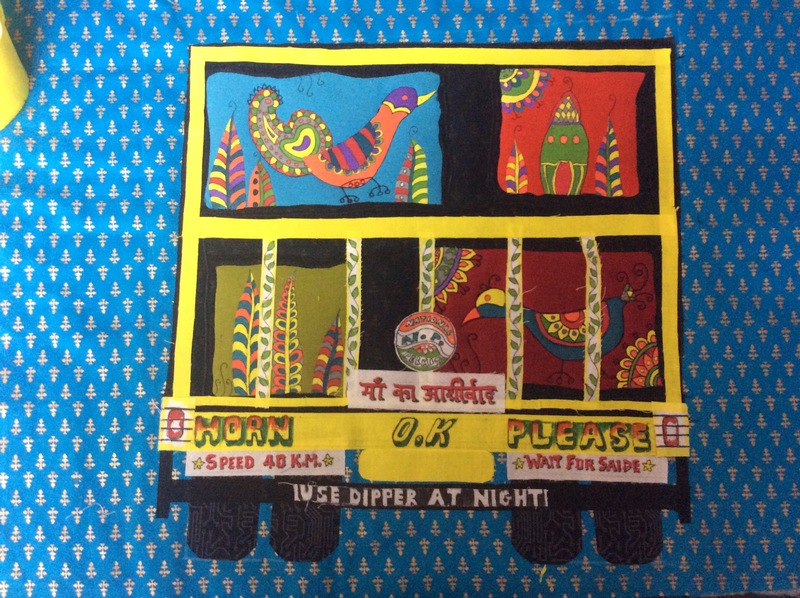 So this is how I set about constructing my very own Road Runner, around Pam’s lovely, colourful design, incorporating some of the essentials of trucks from our highways! Only solids are used here, the bird, leaf ‘prints’ etc are painted. 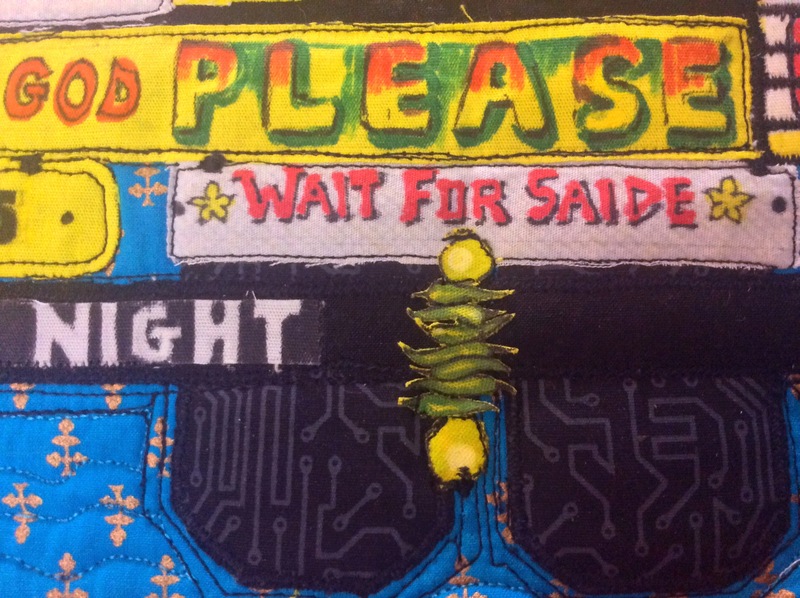 The fabric is fused and either zig-zagged or raw edge appliqued to the background. The truck is tilted (to the right), as are many of the overloaded trucks on our highways! As the Husband and Resident Design Consultant pointed out, the truck was ‘not proportionate’ nor looked ‘overloaded’. So I had to load the truck, and add ‘iron’ rings to attach the ‘ropes’ to tie the ‘goods’ in place. I found some polyfibre fabric in a beautiful neon orange for the ‘canvas’. More proportionate now? The truck is loaded, and I am ready to ‘tie’ the ‘canvas’ down. The polyfibre melted as I was fusing the yellow frame rod in place. I decided to make this a design element and ‘patched up’ the fabric, with obvious darning stitches. The upper boards are hooked on to the lower ones with heavy iron chains, which were crocheted in black woolen yarn and attached to either side. Note that the chains hang down vertically…not angled like the truck. See the ‘Stop’ painted under the chain on the left? 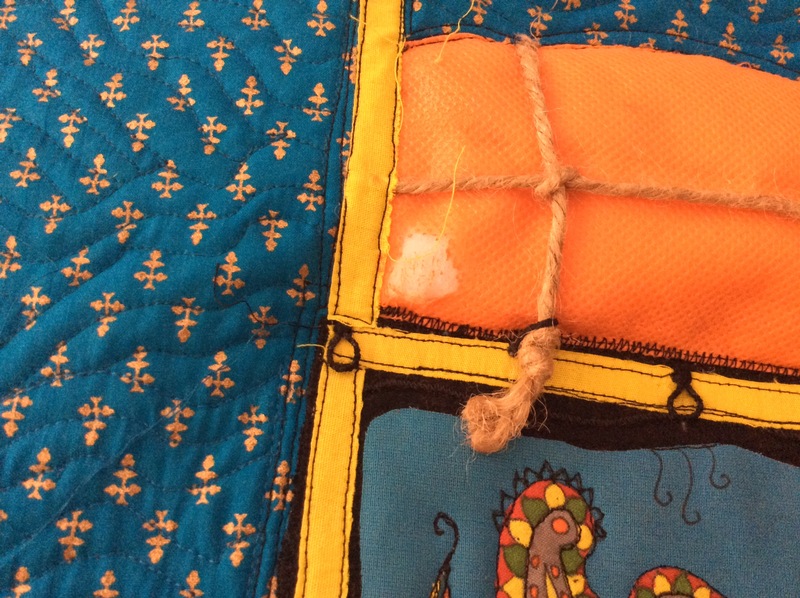 The quilting was kept simple. Angled wavy lines softened the image without intruding on the main design. 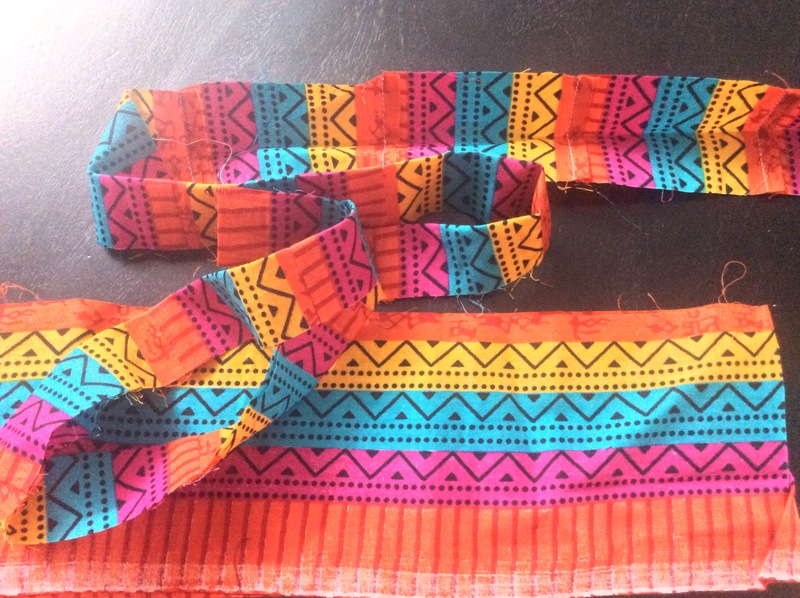 I had to attach a strip of fabric to the backing as it was not big enough. I brought it to the front to add length to the front too. 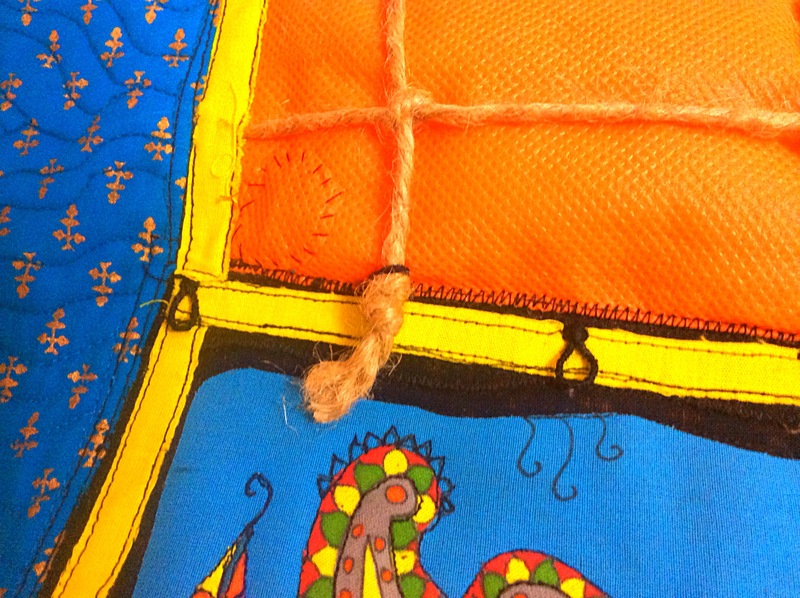 The same fabric was stripped to make the binding. 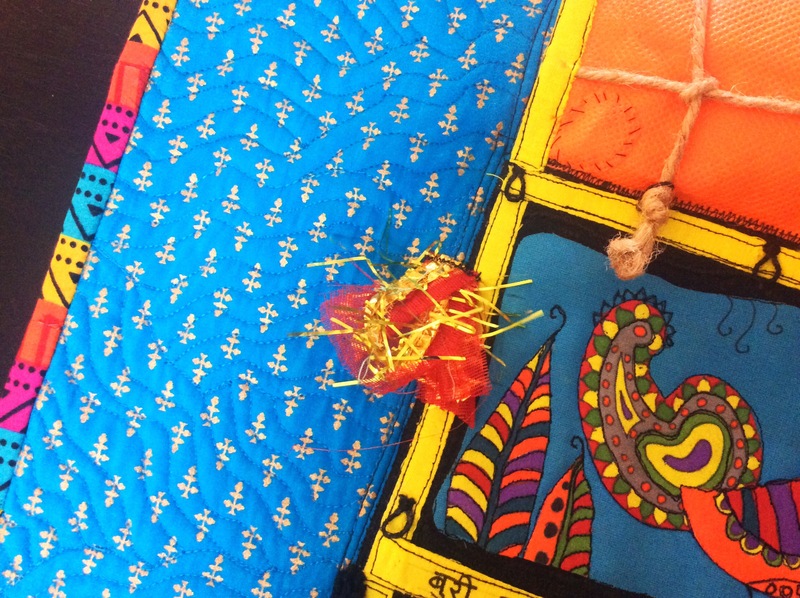 The binding was made with strips a ‘border’ I had lying around from previously used fabric. When we were all done, including the binding, I realized the truth of what the Resident Design Consultant said. The tyres were all wrong; the tyres on the left would be more visible than on the right, if the truck body was tilting to the right. So I had to fuse and stitch a fresh pair of tyres on the left. This is best appreciated in a picture of the back. See the two sets of stitching lines on the bottom of the tyres on the right? 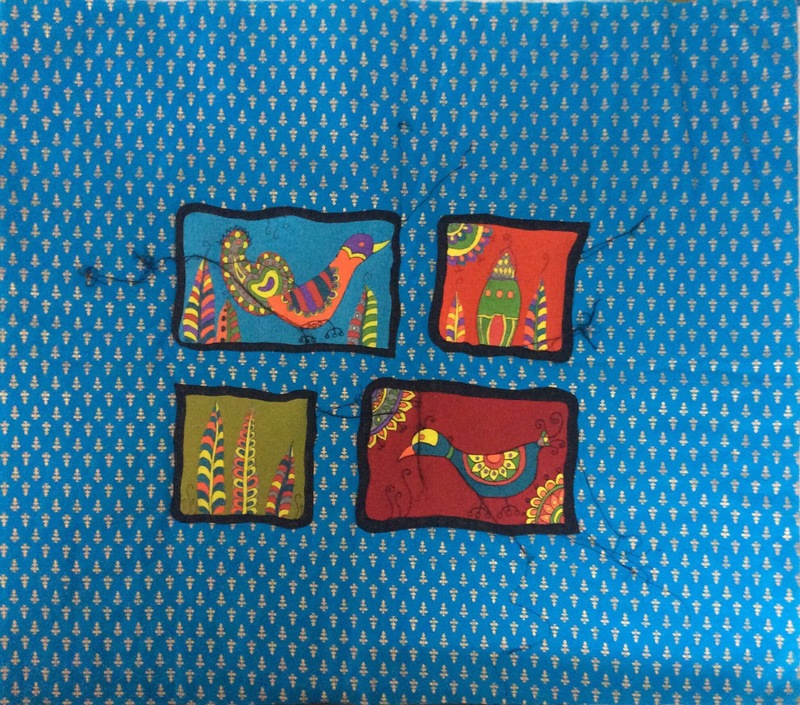 As it happens with me every single time, I first machine stitched the binding, before ripping it and finishing it by hand! Looks so much better this way! 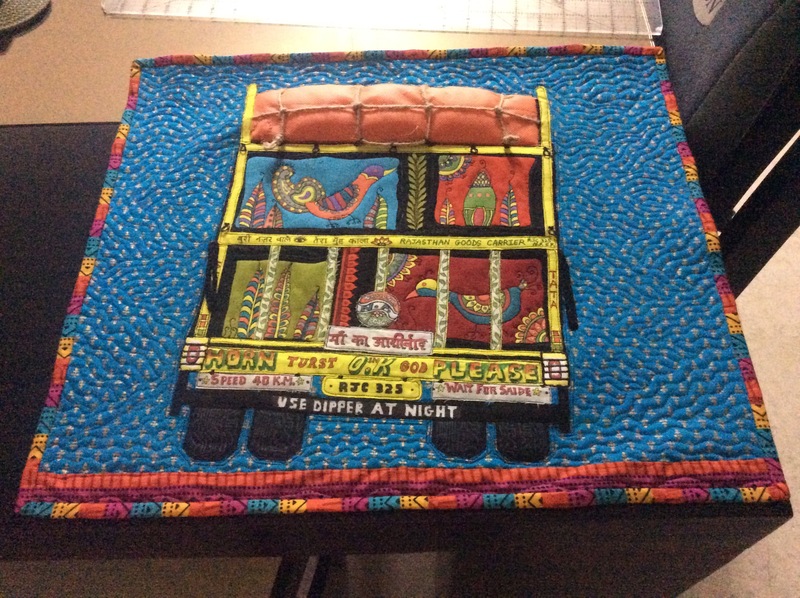 As I went along, I added many details, legends and stories of India’s beautiful trucks, which are best explained through pictures. So let us begin with the ‘official’, mandatory information. First, of course, is the registration number, RJC 325. I thought a great deal about this, before settling on the registration number of the first ever car my father bought, when I was nine years old. A gorgeous Austin A70 in silver grey it was; what can be more precious than the memory of your first ever car? The registration number is that of my Dad’s first ever car! 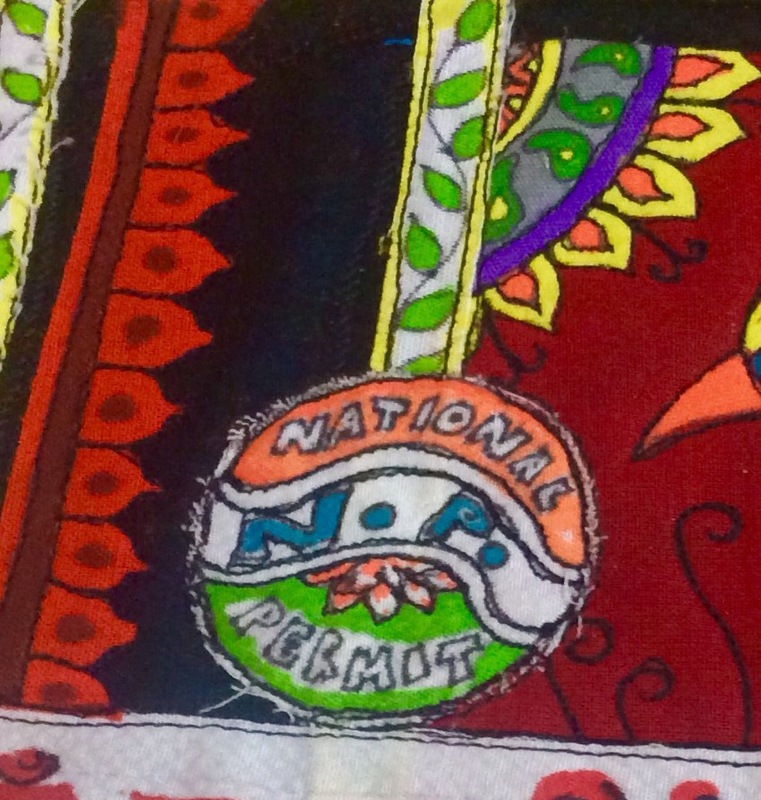 Proudly displayed on my Road Runner is the ‘National Permit‘, which, as it implies, permits my truck to ply on all highways in India! The permit to ply on all highways in India is proudly displayed in the colours of the Indian flag. The name of the company that owns the truck is displayed, usually with the telephone number (which is probably on the side and you can’t see in the back view of the Road Runner). Spelling mistakes are a delight on any truck worth its load, aren’t they? This truck has several of them!) Here, the Road Runner shows its truck registration number again. The ‘S.P.’ and ‘N.P.’ tell you that the truck has a state permit as well as the national permit, just so that you know it! The ‘Tata‘ is not the driver bidding you goodbye, as you might be led to believe. Most trucks in India are manufactured by the Tata Motor Company, India’s largest automobile manufacturer, as is this one. My truck also carries the information about the speed limit, which is the unbelievable 40 kilometers per hour; most trucks travel at at least double that speed! 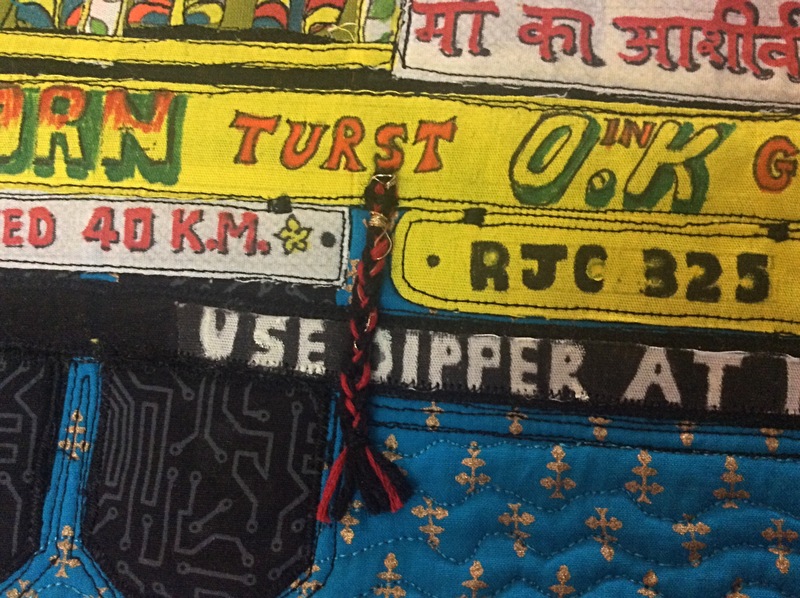 The ‘O.K.‘ in the centre usually is accompanied by the manufacturer’s name – so that most trucks would say ‘ Okay Tata‘ meaning, presumably, that this particular vehicle has been inspected and okayed by the company. However, in the case of this truck, the painter thought it looked nicer here! Then comes the exhortation ‘Horn Please“, the most prominently displayed message on my Road Runner. It likes to drive in the fastest lane ( even when traveling at the maximum permissible speed limit of 40 kms. per hour!) and if you wish to get past the Runner, you have to first ‘blow horn, please’ before ‘waiting for s(a)ide’. …Patience, patience!! The various legends carry loads of information…and exhortations! A driver’s life is risky and naturally, he is a superstitious personage and seeks all the good luck and blessings possible. 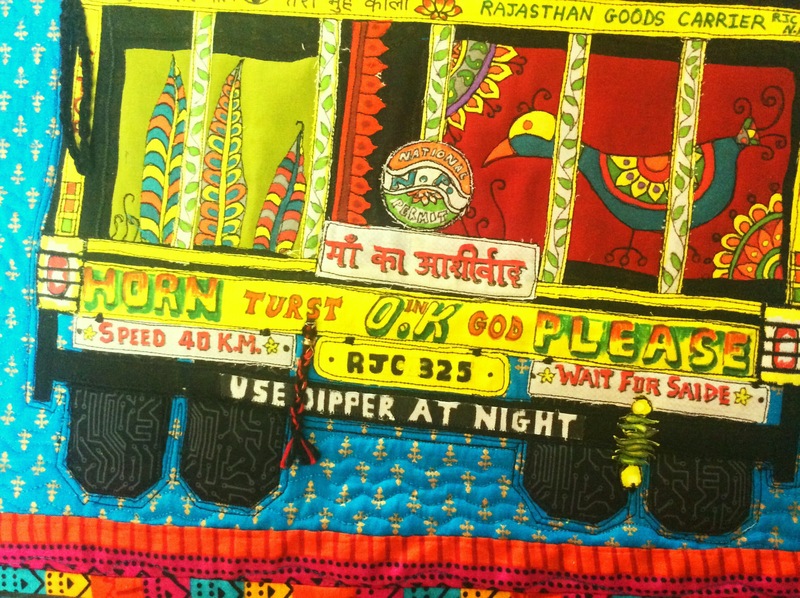 A legend that most trucks in North India prominently carry, besides ‘Good Luck‘ and ‘Trust in God‘, is ‘Mother’s blessings‘. The mother could be the driver’s mother or the Mother Goddess, Devi Ma Herself! 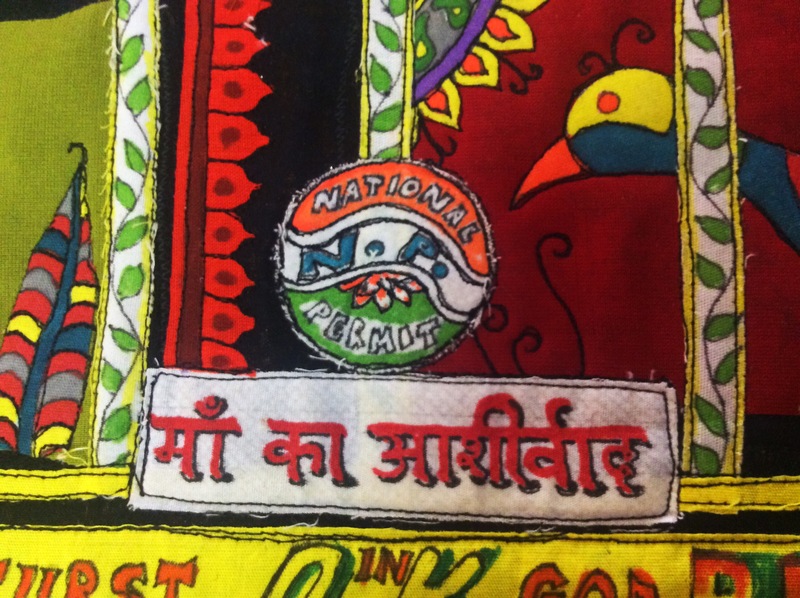 This one carries ‘Maa ka aashirwaad‘ in the Devanagari script , just below the logo for the national permit. 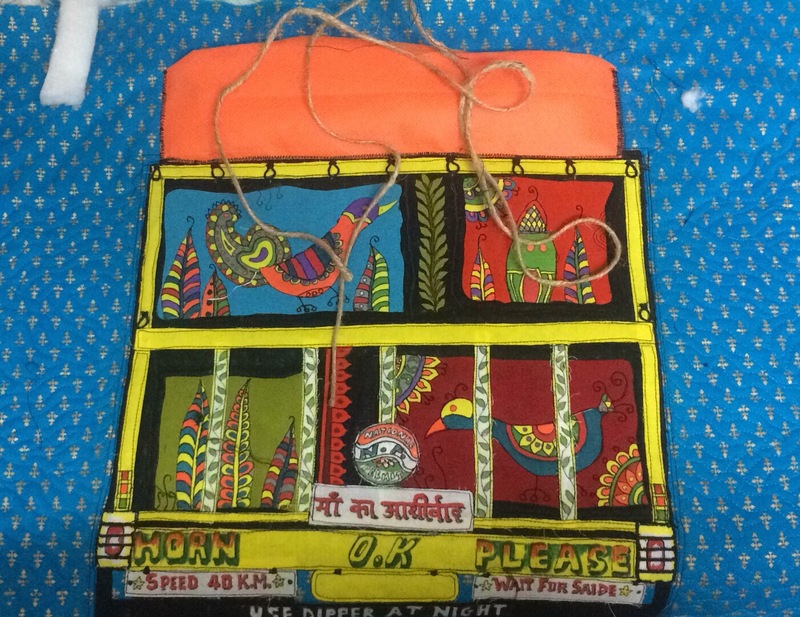 Another form of the Mother’s blessings is this red stole, obtained from temples dedicated to the Goddess, which is tied to the side of the truck, often on the side mirror. 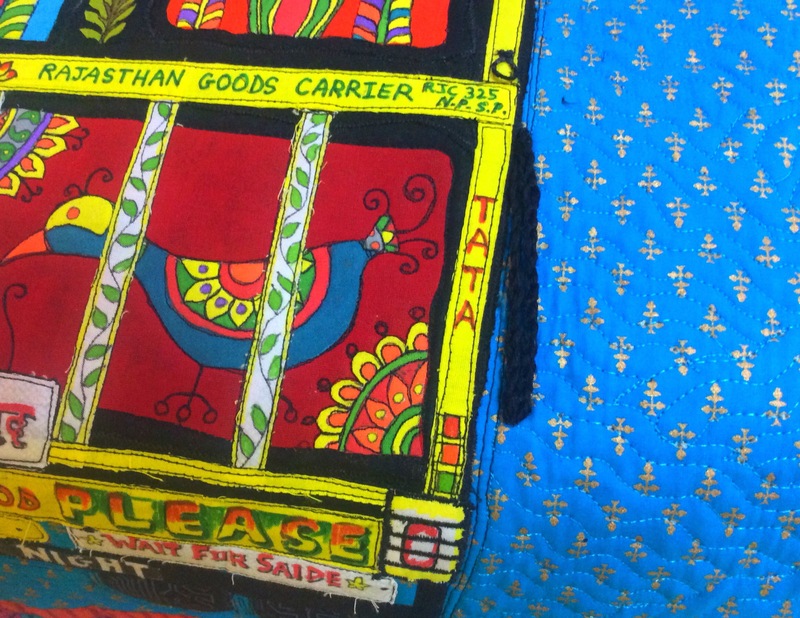 The red stole from a Devi temple wards off evil and keeps the truck and its driver safe. Also to ward off bad luck and accidents is a braid, plaited in black and red threads, tied to the back of the truck. If someone is still audacious enough to dare cast an evil eye on my truck, here is a ⚠️ warning that ought to scare him! May you become an outcaste, if you cast an evil eye on me! The philosophical truck driver, “Think! what will go with you?” and “No one gets anything more than his due before it is due”..
All that will have to wait for Road Runner 2. Well, to get back to my Road Runner, here it is… it is perfectly squared, unlike how it may appear to you!